The news has been distressing of late. The shooting in Tucson has again left us wondering what in the world is happening to our society. The Tiger Mom made me wonder if maybe I wasn't strict enough with my own children, but then, after reflecting, realizing that my children are happy and well-adjusted, on their way to building a life for themselves. January creeps on with more winter storms on the way, while I falter on my New Year's resolutions after only a few short weeks!! So on a positive note, I'm sending a little love your way! I'm reminded of a great song by Sam Cooke, later recorded by the Spinners, so hum along, as I 'sing' the lyrics for you! So, Cupid draw back your bow and let your arrow go, straight to my lover's heart for me! 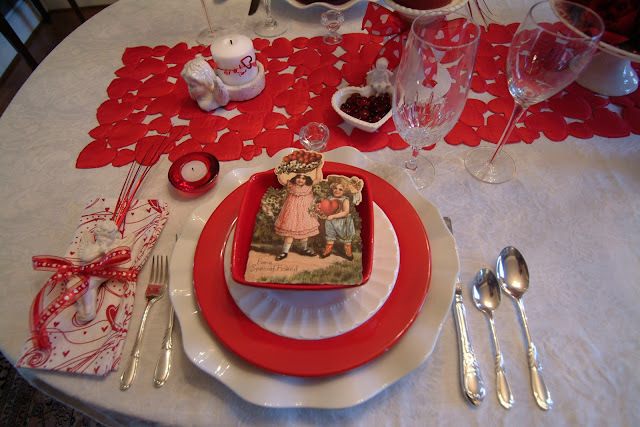 A vintage Valentine for everyone! 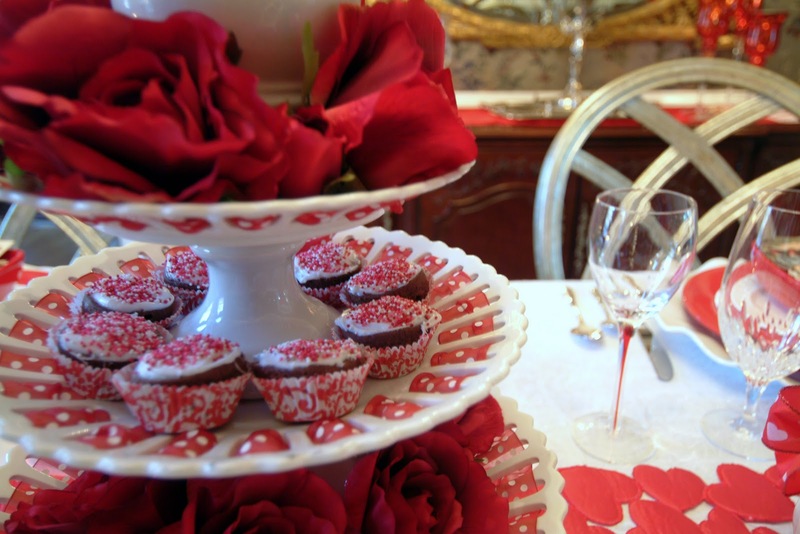 Gotta have chocolate with all this romance! 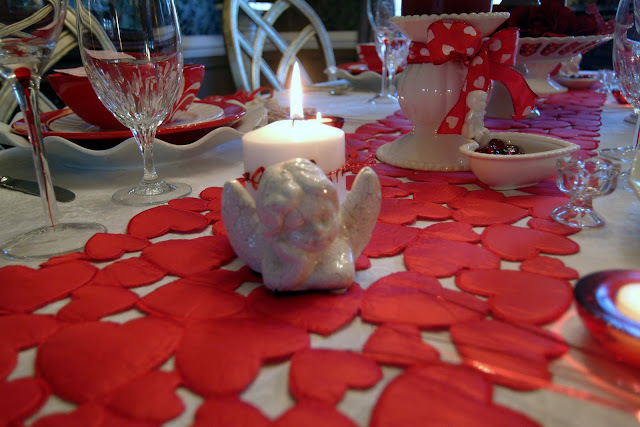 Thanks to my cousin, Pat, for helping me with my Cupid table, and for letting me borrow some of her Valentine goodies! I really love the cupid on the tiered platter and the vintage valentines. This is such a perfect table for Valentine's day, I think your guests will love it! Delightful! 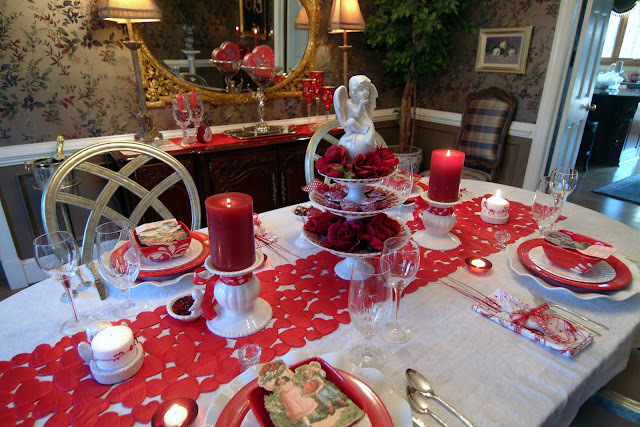 I am sure Cupid will heed your call when he sees this setting! Love the heart red bowls. Great table-I love your centerpiece! Tragic happenings in our world always remind me of the ones I love and keeping them close to my heart. 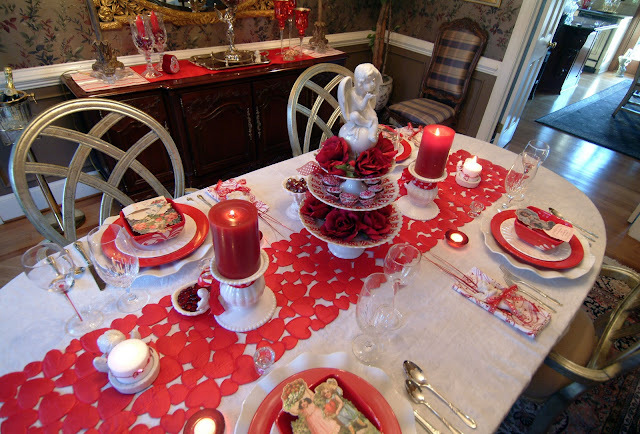 Your table reminds me that love is unoversal and healing. Thanks for sharing! What a wonderful Valentine's Day table! Love all the details and goodies you put together! 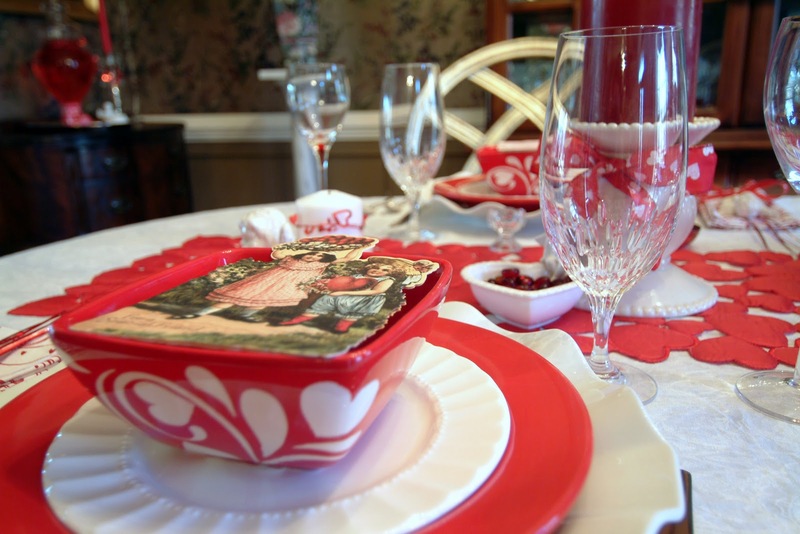 Love, love, love that tablerunner! Terrific song to put to your tablescape! That runner is totally Valentine-ish! 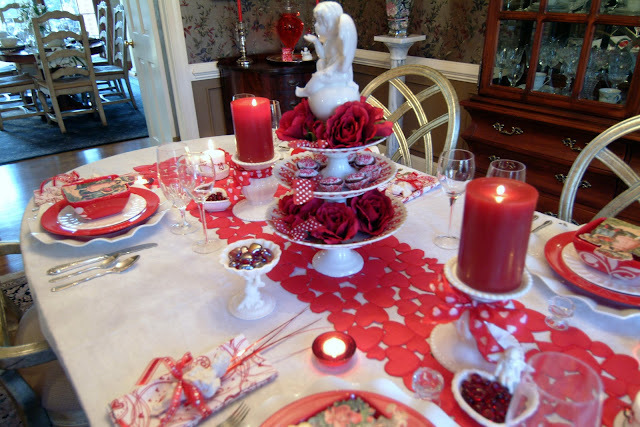 The centerpiece is so creative and goes wonderfully with your theme. 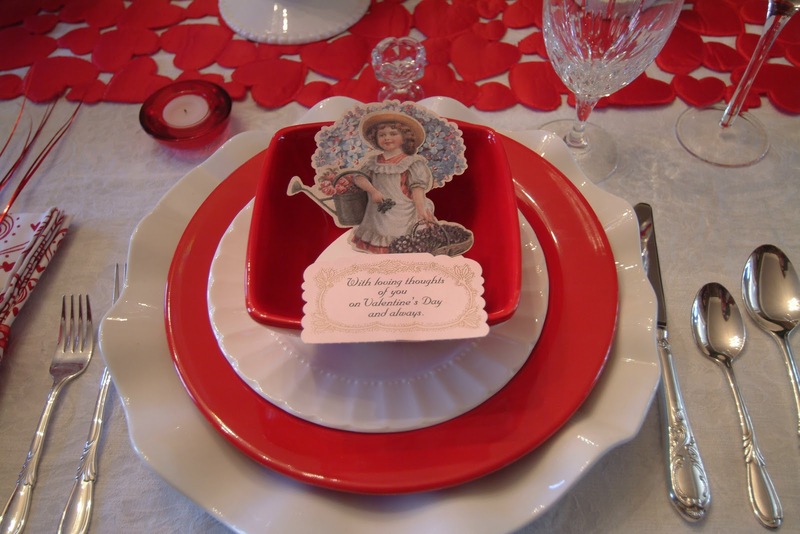 The vintage Valentines are a nice touch! What a beautiful blog. I am so happy I spotted you on the Tablscape Thursday Party - I'm a new follower! I Love your style. Please feel free to stop by my blog - I'm new and enjoy the comments. I LOVE this table! It is wonderful! I really like your runner! I also really like the vintage cards you used in this setting as well! Very pretty! Hi there!!! 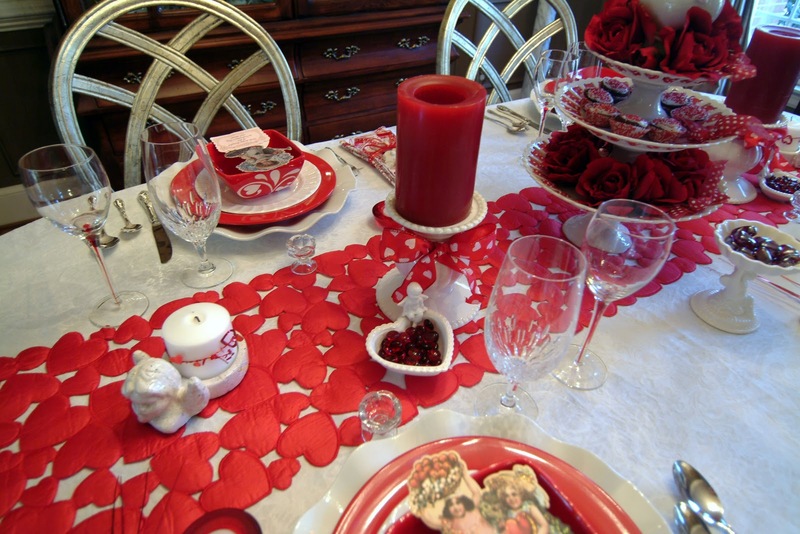 You are really ready for Valentine's Day! Cupid is all geared up and making a grand appearance! I am so in love with those vintage post cards. They have such a romantic feel about them! I bought those same Godinger "Chelsea" stems at Tuesday Morning, and I just love them. They are tall and fairly substantial in addition to being so very, very pretty. I only bought 24...wish I would have gotten more. Sigh! :-( Thanks for stopping by my blog yesterday. I'm slow again this week in getting around to all my favorite ones. Hosting a birthday dinner party here tonight that has been a little perplexing. Everything's cool now, so I'm ready to kick back and just let it happen! Have a wonderful weekend!!! 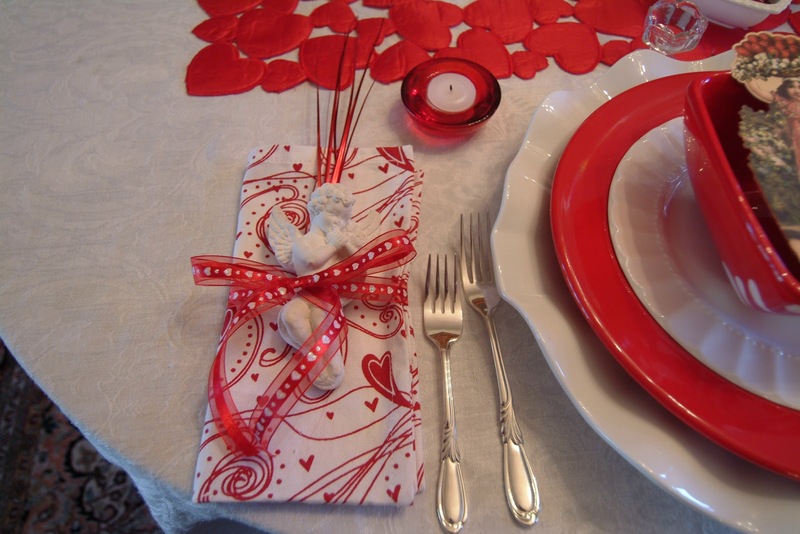 I love that table runner! I was just at a TJ Maxx and they certainly didn't have it there. This is such a pretty table...love the napkins and I always love red and white. Very pretty. 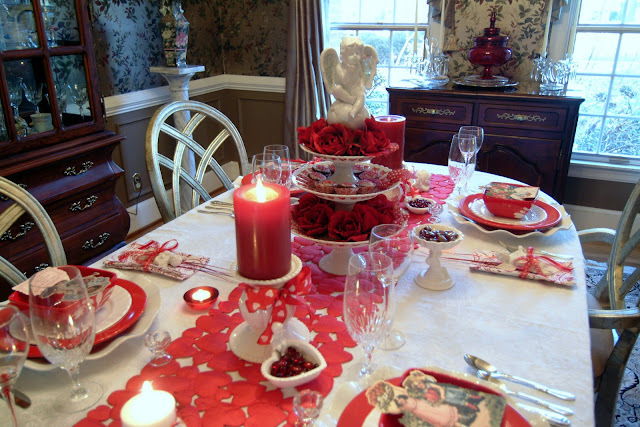 How pretty -- I''m sure cupid will be flying over to peek into your window with all the love on yor Valentine table. Love those vintage valentines. 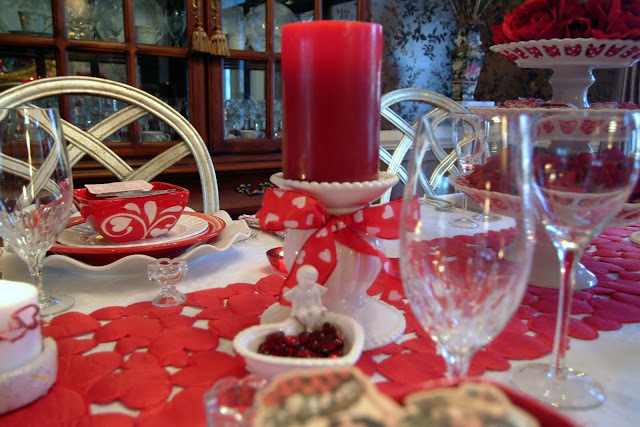 Love your festive table...red and white make me smile. This table is just beautiful!! That table runner is the best. 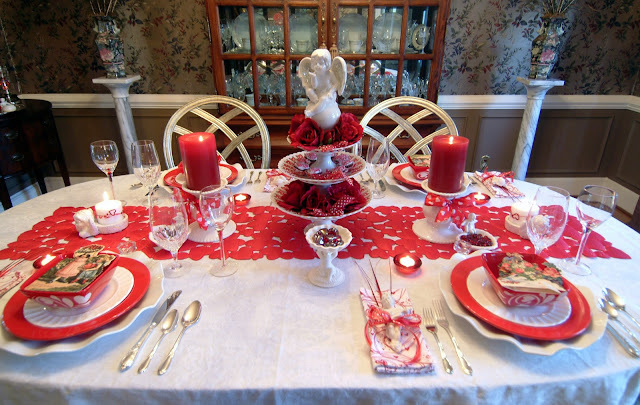 The whole table is wonderful...love the napkins. The cupcakes look delicious. 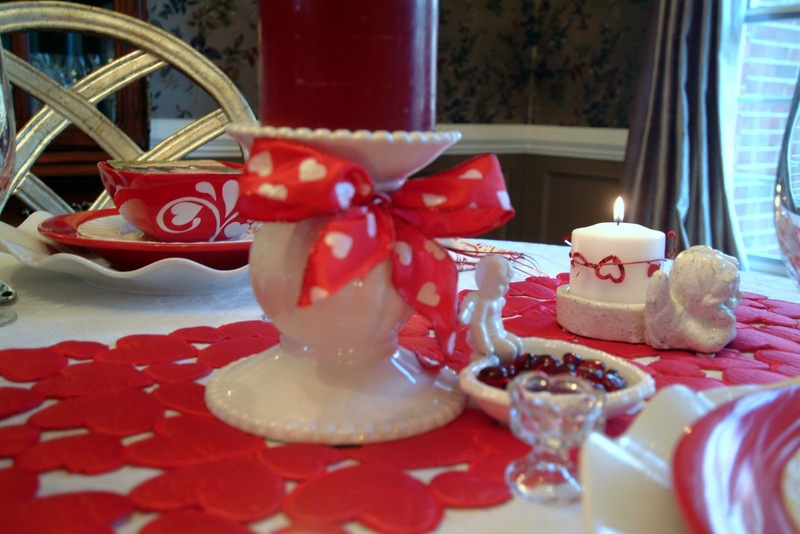 Enjoy your Valentine's day!! 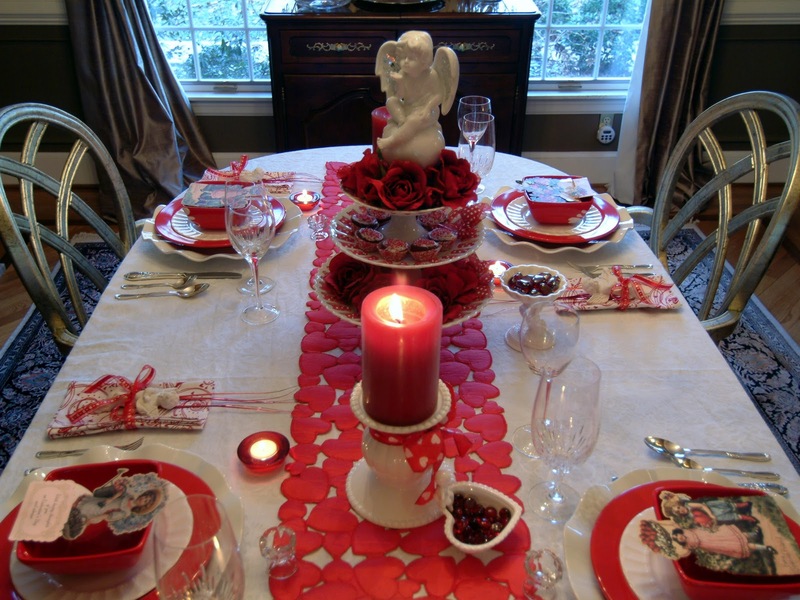 What a great tablescape and I especially like that heart runner! I looks so pretty against the crisp white of the tablecloth! Oh, this table is lovely! Just a perfect Valentine tablescape, and all of the details! You did a super job with this! What a great table. So many pretty details~ You did a LOVE ly job!! I remember that song too! Very pretty! I was actually thinking I would just pass on the Valentine theme this year -- till I saw yours! 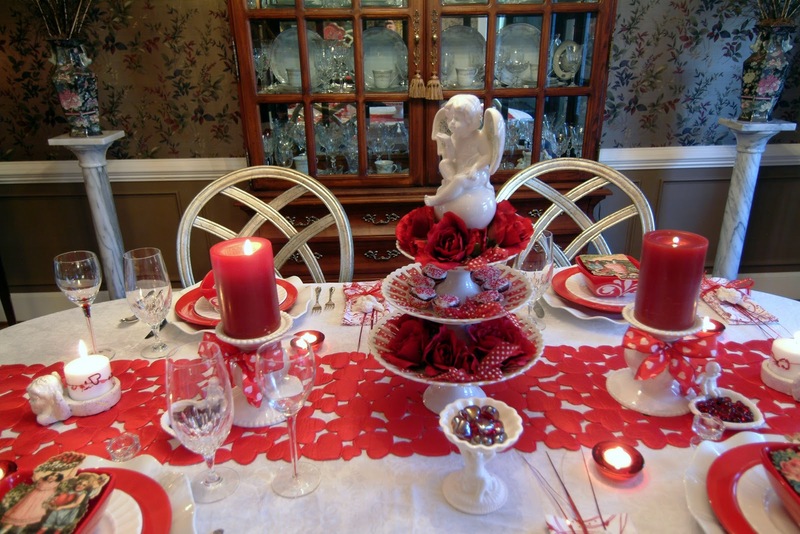 I love the centerpiece! 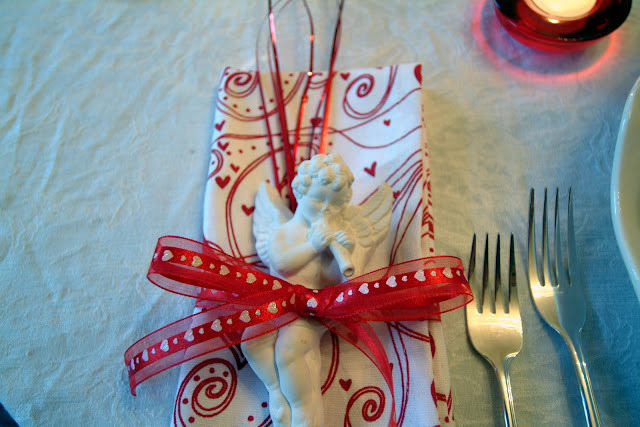 How cute is that with cupid perched on top! All the accents like the vintage looking cards are perfect. 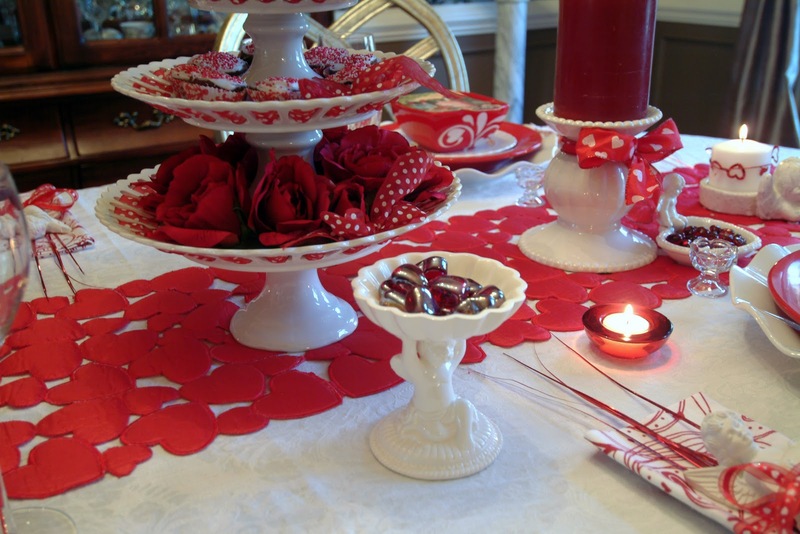 The table runner puts it all together! Wow, you're all set for romance! Thanks for being nice enough to post on my blog. I'm always excited to get comments!